Buslist came up with the correct answer on another channel which is the missing Diesel fresh air intakes over the side quarter windows at the rear. 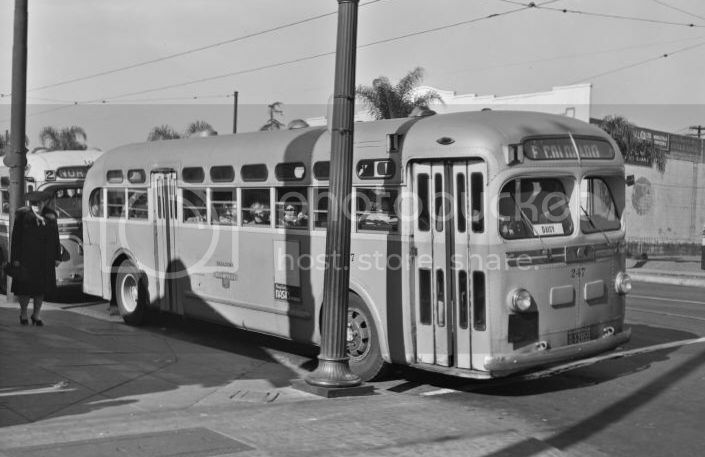 However, as agreed upon by all, this may have had nothing to do with the after market A/C units because there were orders of these buses delivered from the factory sans the vents including many 4801's for California. Buslist does bring out one interesting idea in that installing the intakes inside an air conditioned bus would do a better job for the engine then ingesting hot air from the exterior. 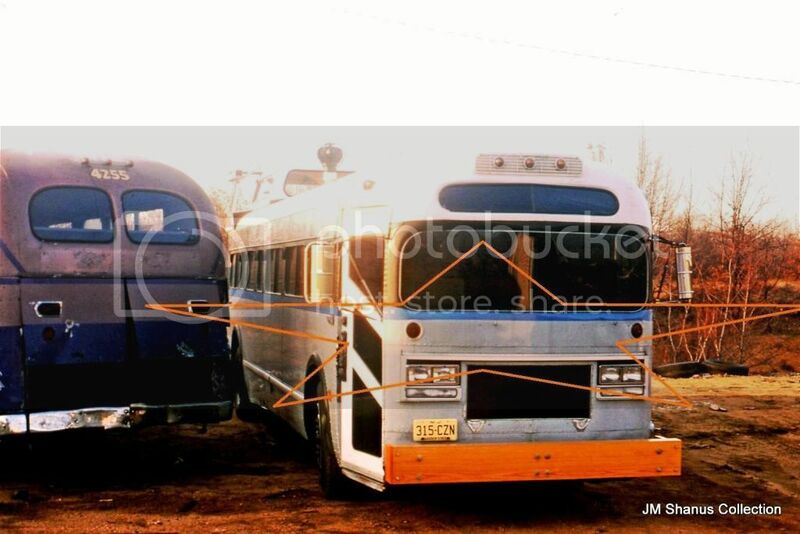 There is only one hitch here; experts have always maintained that the hotter a Diesel engine gets the better it runs. You are confusing engine operating temperature with air intake temperature. Operating temperature is only slightly related at air intake temperature. Operating temperature is controlled by the cooling system and thermostat settings. Air intake temperature is important as the warmer the air the less dense it is (why we need longer runways at "high/hot " airports). Less dense means less oxygen for combustion. Cooler air from inside the bus would contain more oxygen per cubic foot, supporting more combustion and greater power. Nice Aerocoach conversion. Too bad it wasn't owned by Aerosmith! 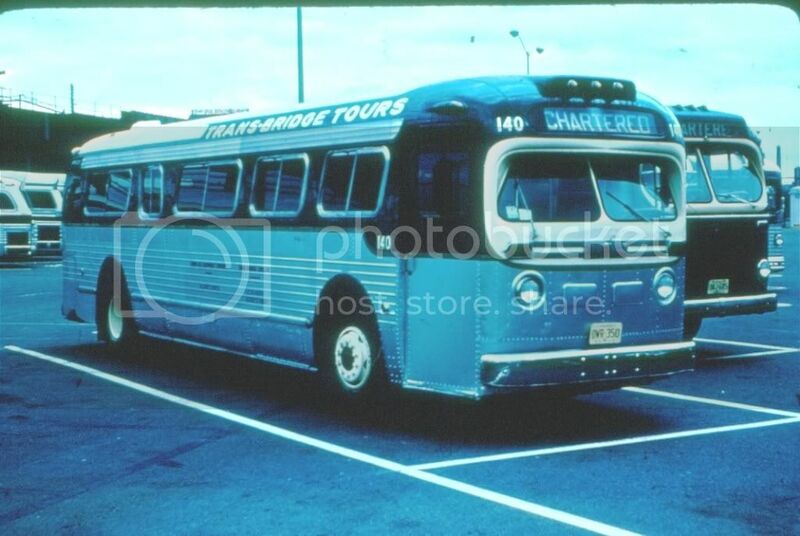 As we can see in the lower photo of Trans Bridge Tours, Inc. # 140 (already showcased earlier in this thread), the artisans of the company shops at Phillipsburg in western New Jersey were adept at remodeling their fleet of pre owned TDH (or M) 4509's. While # 140 was a radical upgrade with its 'New Look' passenger windows and sedan door, sibling # 139 (upper photo) shows only a rather odd removal of its rear door with that oddity being a sealed window which catches the eye almost immediately. Most single door 4509 transit platforms from the factory wore openable windows in place of rear doors. Also note on # 139 some unusual appendages on the rooftop which might have to do with ventilation - one such device also appears toward the rear of #140. Upper photo courtesy of 'ttcbeat' and is available at eBay as item # 381118863634. Lower photo has been credited earlier in this thread. Some things should be left alone! Love the sedan door. Looks like sheet metal over plywood with a $ 1.29 drawer pull for a handle. Can anyone figure out the bus behind the Brill? It looks like another upgrade job with the fluting on the front clip. Here's another one that really takes the cake! Seen sometime in 1978 at South Amboy, New Jersey is what I believe to have once been a single door 4509 or 4512 with absolutely no hint as to its origins unless someone in the audience recognizes the paint combination. Of note (and I'll need a lot of room in this paragraph) are the modifications to the front clip including a heavy wooden bumper, dual headlamps and parking lights, a throwback to the original Old Look flat windshield of 1940 and I have no idea as to what the black blank is between the head light frames (at least the destination sign glass, Thermo-Matic intake and Michigan Markers have been retained). As far as the door goes, the one on my backyard wood shed looks better and the job of covering the standee glasses is sloppy at best! I would have to say that the highlight of the conversion though is the cupola at the rear of the roof which is almost indescribable along with an odd looking appendage which could be a ventilator. On a scale of one to ten, I would have to give this job a one! (or "Thumbs Down"). Looks like its mad and ready to attack somebody. As most of us know, the first GM old looks produced sported vertical windshields. 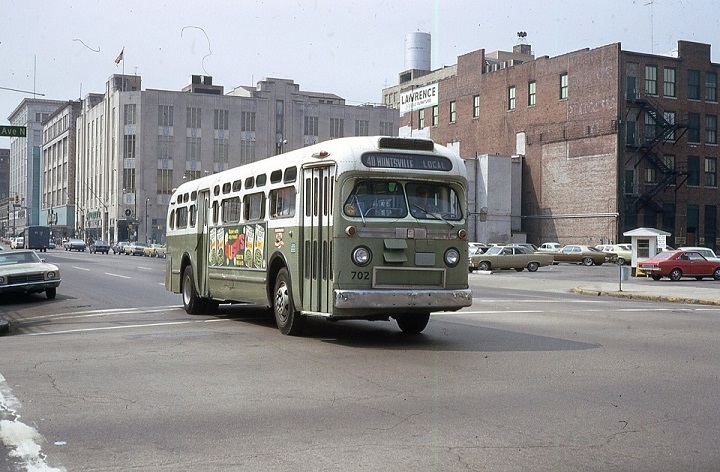 Due to reflection problems with the drivers and inspired by the special PCC lookalike old looks of St. Louis' unique TG-3603 model, buses manufactured with angled windshields became the standard shortly after. 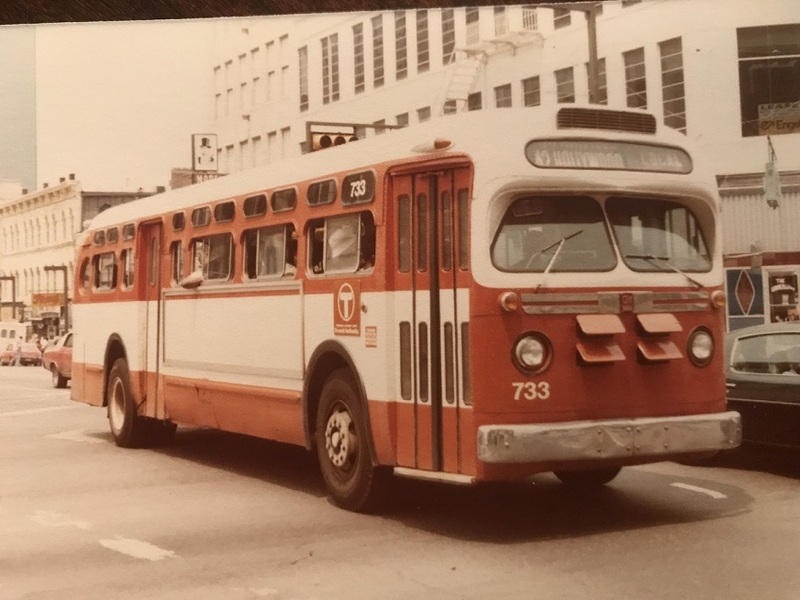 Most bus companies made do until the buses were replaced with newer models, however a few made an attempt perhaps on a experimental basis to replace the original windshields with angled ones most likely in-house jobs. Here we see one of them. Pasadena City Lines #247 either a 3601 or economy model 3602 with interesting results. It may have solved the reflection problem, but a new problem arose - namely the driver's curbwise blind spot caused by the intrusive center post. Image courtesy of Rogali's Photos for educational purposes. 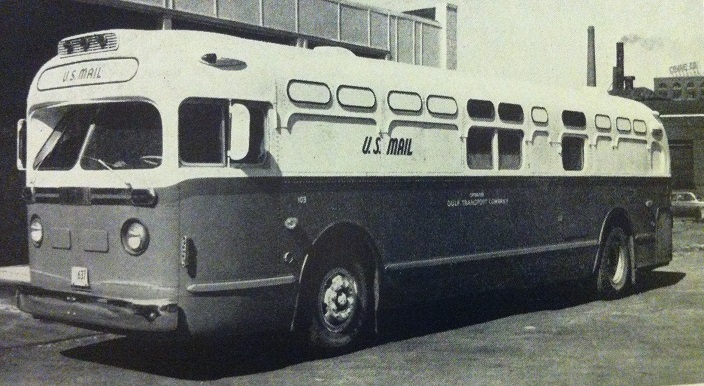 Here is another oddity, one of 5 GM TDM-4509 as a Highway Post Office operated by Gulf Transport Company. It wasn't just NYCTA who had sliding windows on the GM old looks. Here is a perfect example of a TDH-4512 with sliding windows. 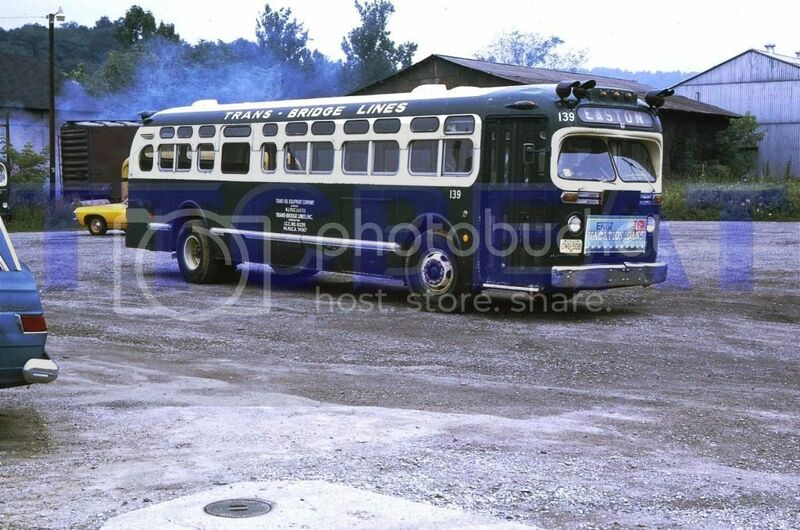 Makes me think maybe this photo was taken someplace in Alabama (due to the "Huntsville" route sign); there are 2 vent doors on the curb side front of this bus (making for a total of 3 vents if you include the single vent on the driver's side). Probably this was somewhere with a warm climate (again suggesting someplace in the South). It has 4 vents on the front not 3. I did a zoom in.